We found the picturesque Three Creek Lake in Deschutes County, Oregon above the town of Sisters. It is 76 acres and relatively shallow at 11–28 feet in depth. It sits at an elevation of 6550 feet located in a glacial cirque, formed by the Cabot Creek Glaciation about 13,000 years ago. Surrounding Three Creek Lake is the Tam McArthur Rim, named after Lewis Ankeny McArthur (for some reason known as “Tam”) who was the Oregon Geographic Board Secretary from 1916-1949 and the author of “the authoritative source for information on the origins and history of Oregon place names” Oregon Geographic Names. 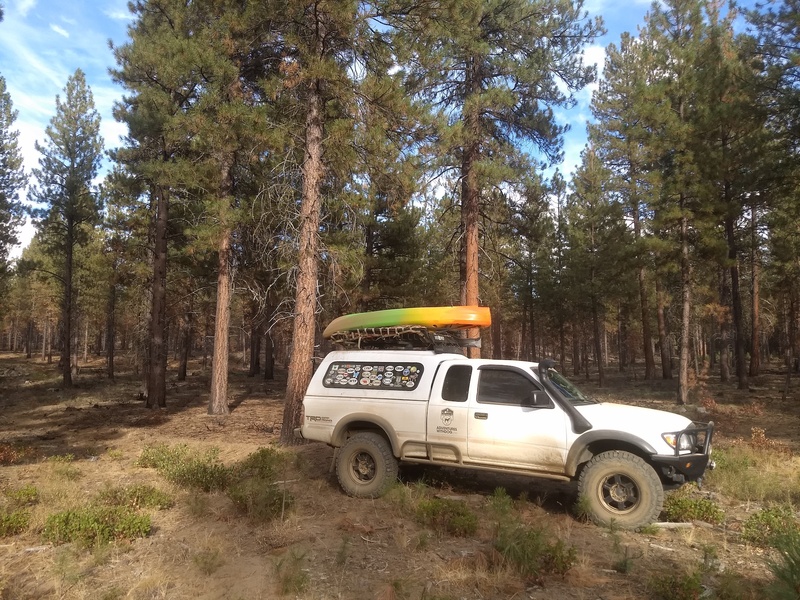 We were camping down the road in Deschutes National Forest with a buddy. I spent a couple of days playing/training with the DJI Spark drone I bought used in Baja from a guy on the beach. He had three drones, this one was the smallest. His wife insisted he pare down his hobby so he made me a good deal. 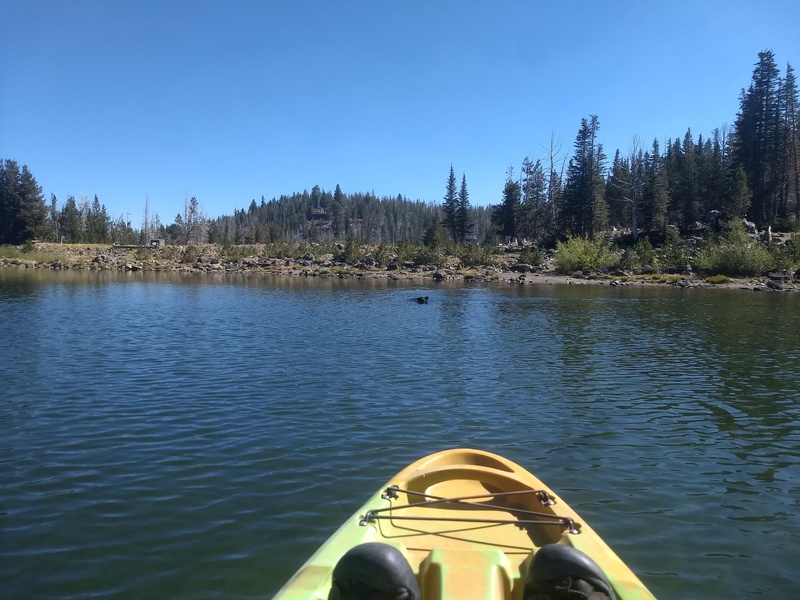 During a nice, clear, warm day we decided to head on up to Three Creek Lake and test out our new (to us) kayak. From our campsite it was about 7 miles (4.5 miles paved, the rest less-than-smooth dirt) and 3300′ in elevation gain to the lake. 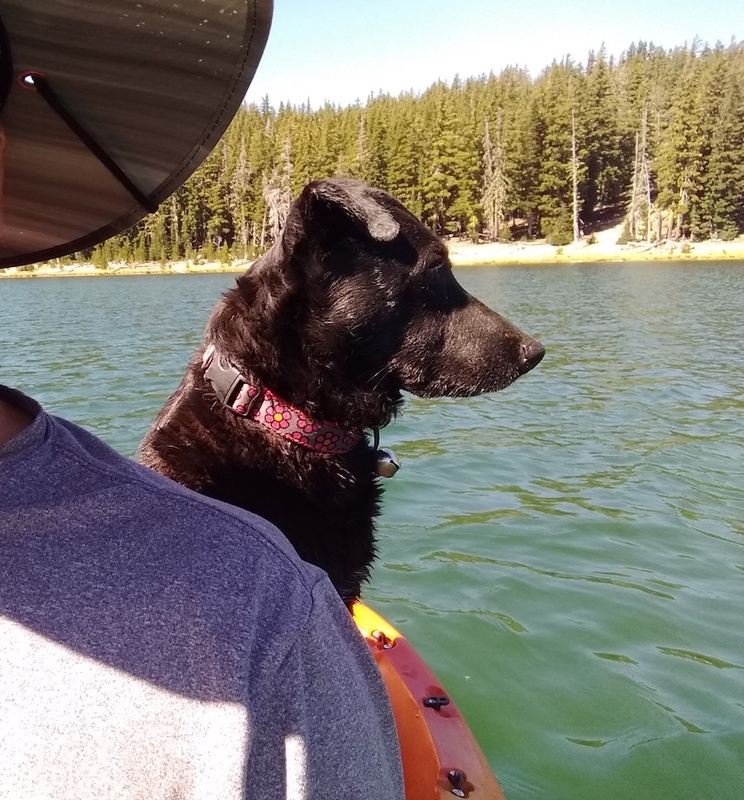 Once we arrived we pulled into the primitive boat launch area, let Willow out of the Tacoma to sniff around and I proceeded to unload the kayak, a Perception Access we bought used at an REI sidewalk sale. It came without a paddle (which you kinda need) so we bought a one-step-up-from-beginner Aqua-Bound fiberglass paddle. Once it was in the water I had Willow jump up on the back area of the kayak I had set up for her with a piece of velcro-attached foam padding so she could sit comfortably and anchor herself with her claws if need be. As soon as we pushed off she decided to abandon ship and headed the 5 feet back to solid ground. First test = failure. Once on shore she stood in the water and watched me paddle a short distance away. Soon enough though she decided she would rather be with me and swam out towards the kayak. 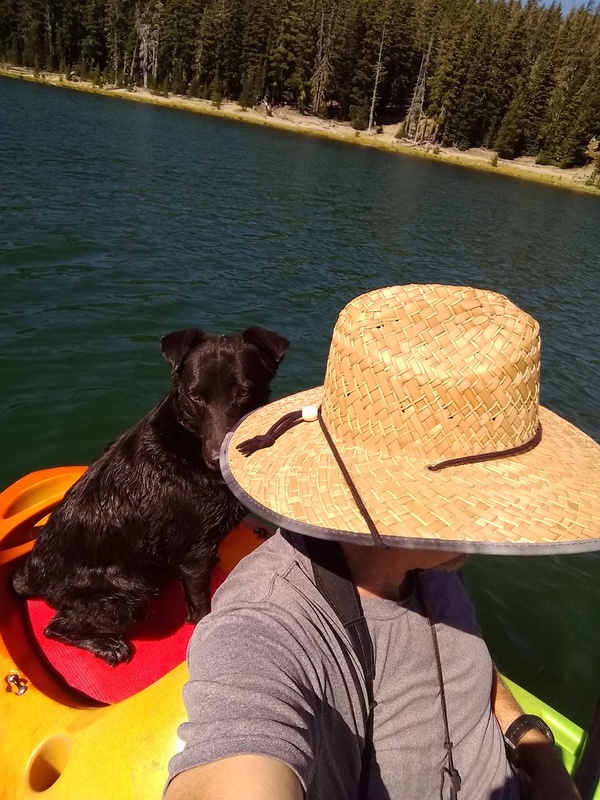 Once she arrived I had to carefully shift my weight so I could haul the soaking wet, heavy, stinky dog onto the rear of the kayak, which is directly behind my seat, without tipping over and ruining or losing my non-waterproof phone so that operation was a bit dicey. 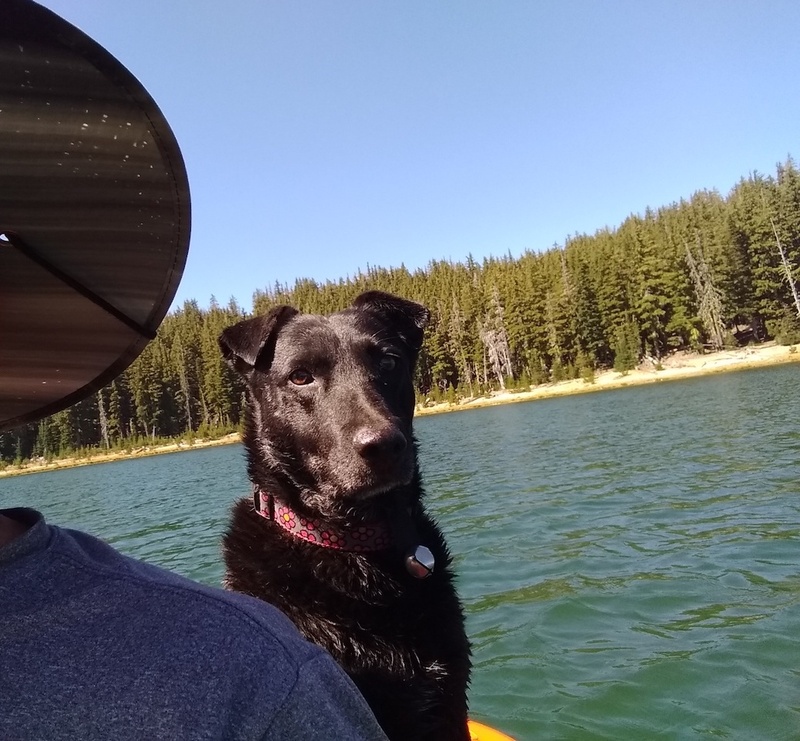 As we turned away from shore and headed out and across the lake she quickly got situated, comfortable and used to the rhythm and rocking of my paddle strokes. A couple of other people were out on the water fishing while several others were in kayaks. 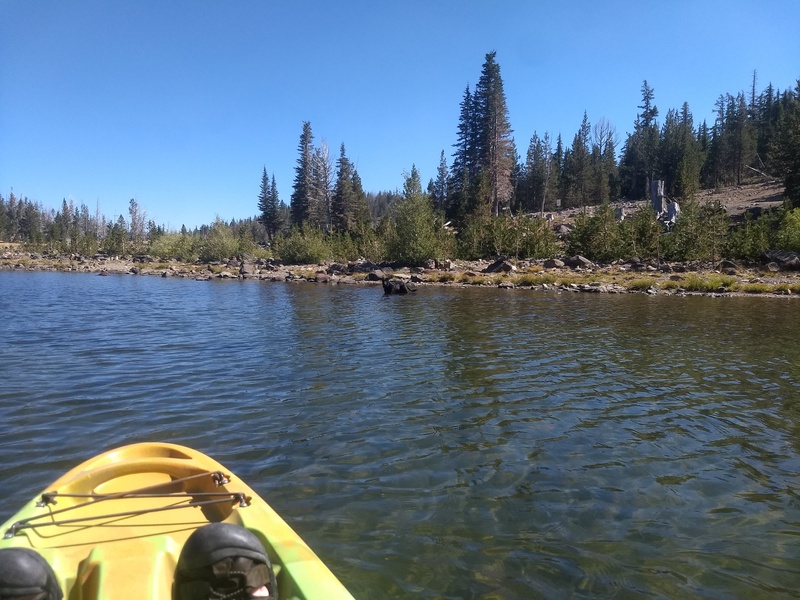 We saw many fish jump, some quite near us and there were a few times I felt her tense up and I had to stop her from launching off the kayak to try and catch the fishy. Tense moments. Once I had my paddling settled into a rhythm we made good time across the lake. A couple of people on the water and on shore noticed Willow on the kayak and waved. After we reached the opposite shore we turned and headed back since I didn’t want to take any more chances with my phone. Next time I will store it in the little waterproof pouch I have for it but just couldn’t find in a timely fashion that morning. Once back at the launching area we came to the same conclusion that our second test was a resounding success and we should do it again as soon as possible. If you would like to experience the beauty and serenity that is Three Creek Lake you only need to head about 15 miles SSE of the town of Sisters on Forest Service Road 1600. 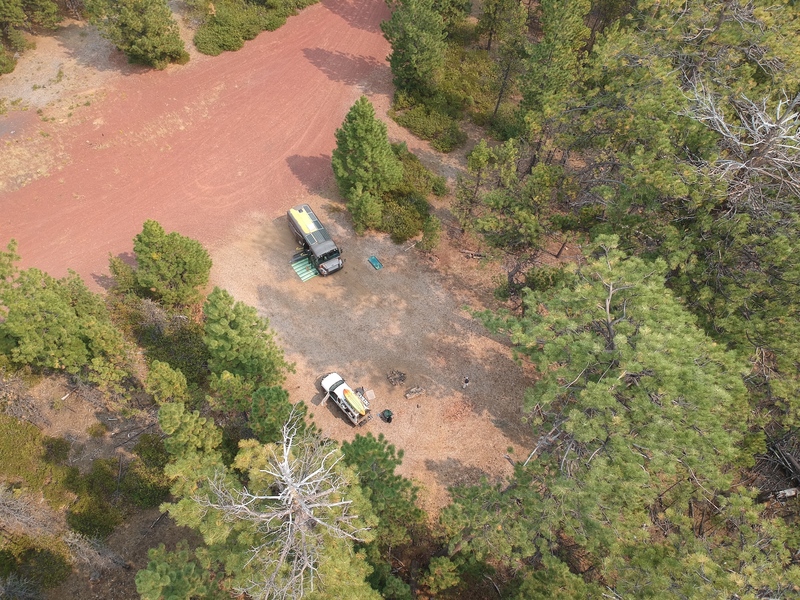 Please be sure to check with the Forest Service Sisters Ranger District before heading in that direction as the whole area can be closed due to snow or forest fire. 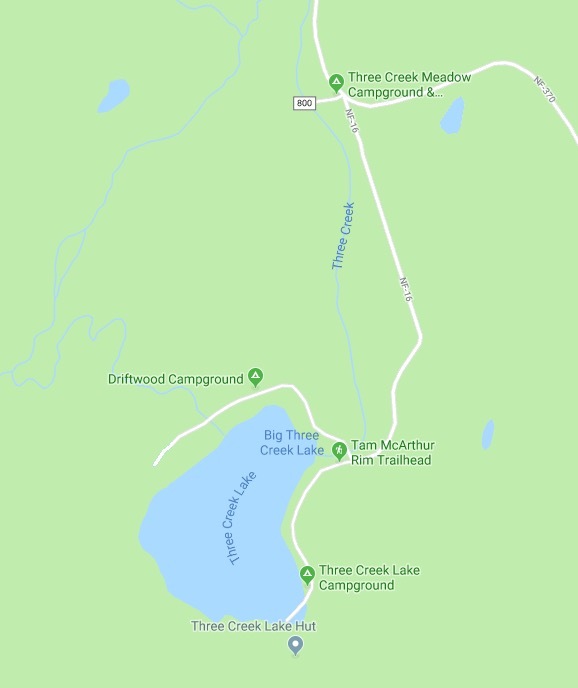 There are three campsites in the vicinity, two right on the lake (Three Creek Lake Campground and Driftwood Campground) which have no services except outhouses and charge a fee. The other campground, Three Creek Meadow is about 1 mile back toward Sisters and caters to horse owners. It has horse facilities, a camping area and also charges a fee. If fishing is your focus the lake is stocked each Spring with Brook and Rainbow trout. Please be aware that motors are not allowed on Three Creek Lake which makes it a nice, quiet, no wake area. Hiking opportunities abound in the area with the Tam McArthur Rim Trailhead the prime destination and located right when you get to the lake. A free permit is required and you can fill it out right there at the trailhead.